Buy Online Now! 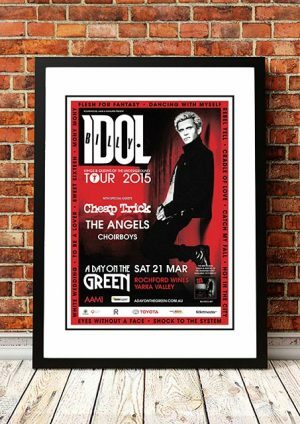 Classic Billy Idol Concert Posters and Memorabilia. When his punk band, Generation X, broke up in 1981, oft-sneering singer Billy Idol moved to New York City and made the transformation from scrawny punk-rocker to slightly less scrawny new-waver. His cover of Tommy James and The Shondells’ “Mony Mony” (Number One) would finally chart in the form of a liver version in 1987, while a remake of Generation X’s ode to onanism, “Dancing With Myself,” wouldn’t take off until 1983, when MTV placed its Mad Max-style video in heavy rotation. Idol’s full-length debut, Billy Idol, must have come as a shock to those who had watched his early career in Britain: The lead-off track, “Hot In The City” sounded like Bruce Springsteen with a synthesizer (Idol’s guitarist and co-writer, Steve Stevens, also played keyboards). And while the follow-up single, “White Wedding” was slightly more menacing, Idol had established himself as a Top 40 contender. We stock an awesome Billy Idol Print.